The weekend before we moved into our new house (Eeee!) we went up to Omaha beach to celebrate my 25th birthday. And in true "grown up" fashion, I made everyone dress up as sailors... Ahoy! Even though it was forecast to rain, the sun stayed out which meant a lot of cycling trips through the dunes to the beach. On the Sunday we went to the Matakana Indie Craft Market where I bought a few little goodies as well as some tasty treats. This market is on every third Sunday of the month... I highly recommended it :) Thanks Alana for some of these cute pics! I shared this photo of this AMAZING letterbox that I found down the street where I work on instagram (@toriveysey). And because I'm so in love with it, decided I needed to share on the blog too. 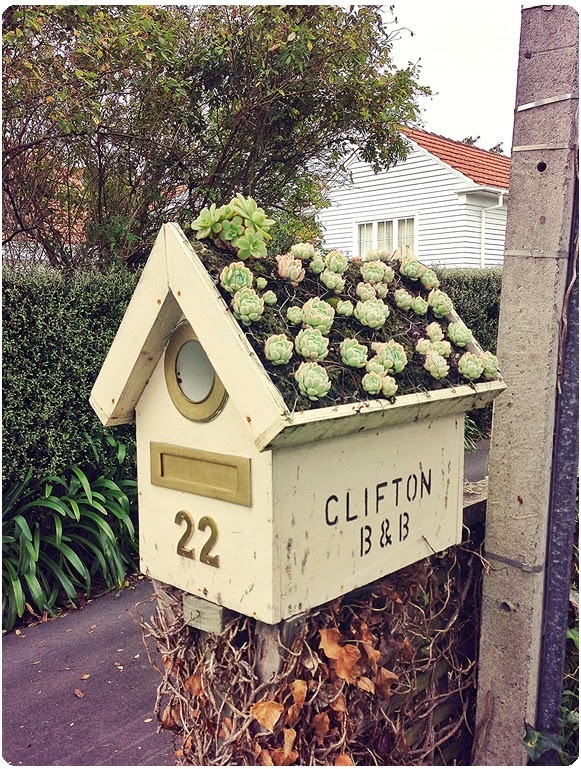 We will be moving into our first home is two weekends time and I have schemes to make a letterbox like this! But, if the husband disproves, there will – at the very least – be a few of these scattered about the place. Obsessed! 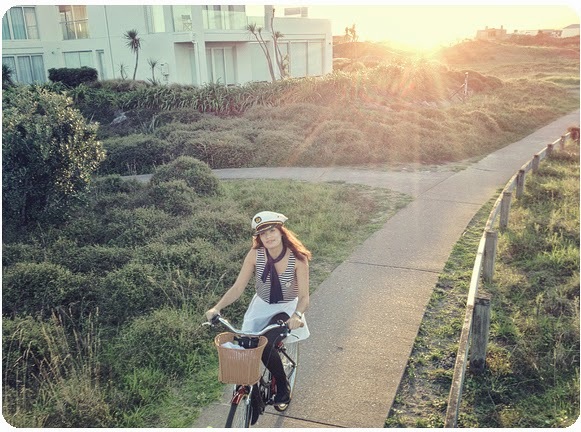 It seems that lately I have been on am unintentional blog hiatus. When I opened up these photos I realised that they were taken in February! I don't know what it is about this year but it is May already and I feel like I'm playing catch up. Plus, Brendon and I have bought our first house!! Eeeee! We get to move in at the end of May so I can't promise any more posts between now and then either! Uhhh I'm such a slack blogger. Anyway... This little project was devised from a need for a case for my external hard drive. My drive is quite compact and I often carry it around in my handbag, but it needed a little protection in case I dropped it and to guard it from the scissors that are often in my bag too. (Yup my bag is basically a giant pencil case). 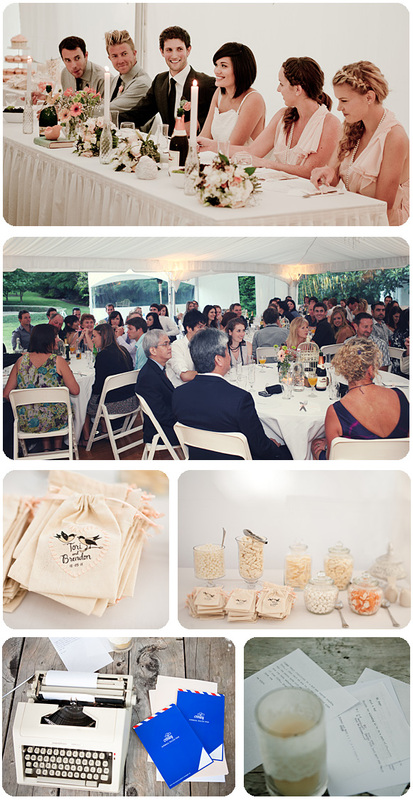 I decided to make a drawstring bag similar to the favour bags that I made for our wedding – only a bit larger and lined with bubble wrap. You'll need: Fabric, bubble wrap (or something thickish and soft), sewing machine/needle and thread, ribbon or string and fabric paint or pen. First I measured how big my bag needed to be to fit the hard drive inside it (I wanted it to be quite snug). Then I folded down the top edge of the fabric twice – first a small fold and then a larger one where my draw string would eventually thread. Then I did a little snip just under the folded fabric. I unrolled the fabric, tucked in the sides about the snip and then folded the fabric back down on both sides. Then I added the bubble wrap. 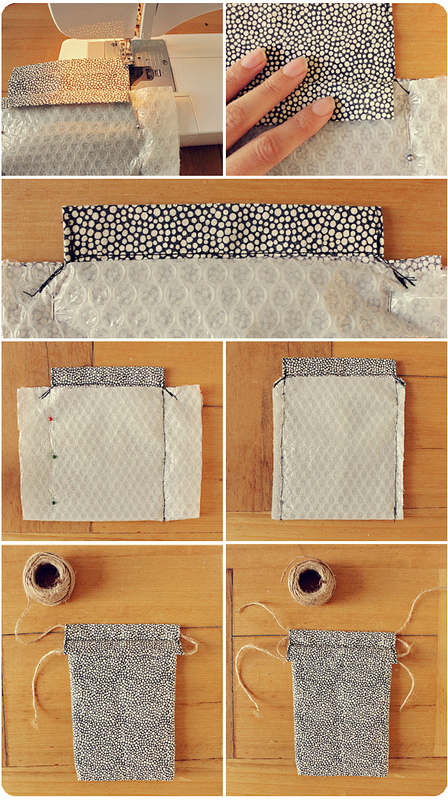 Sew down the sides where the draw string will go (before it's rolled down) and then fold it down again. Sew along the bottom of the draw string fold making sure you don't sew the bag closed shut. Flip over and repeat. Stitch the side of your bag and turn inside out. Thread your string or ribbon through one side of the bag and then trough the other (as pictured above). Then repeat with another piece of string on the opposite side. Tie a knot nice and close to the bag. Ta da! 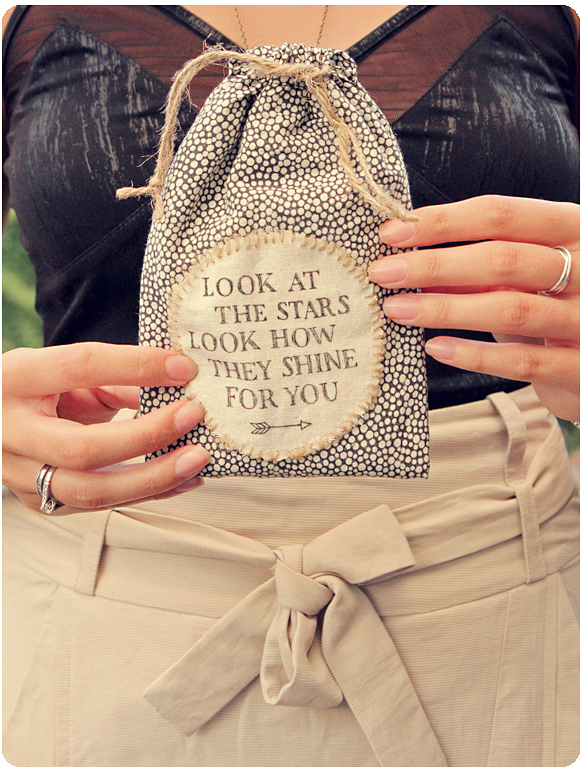 You have a simple draw string bag. 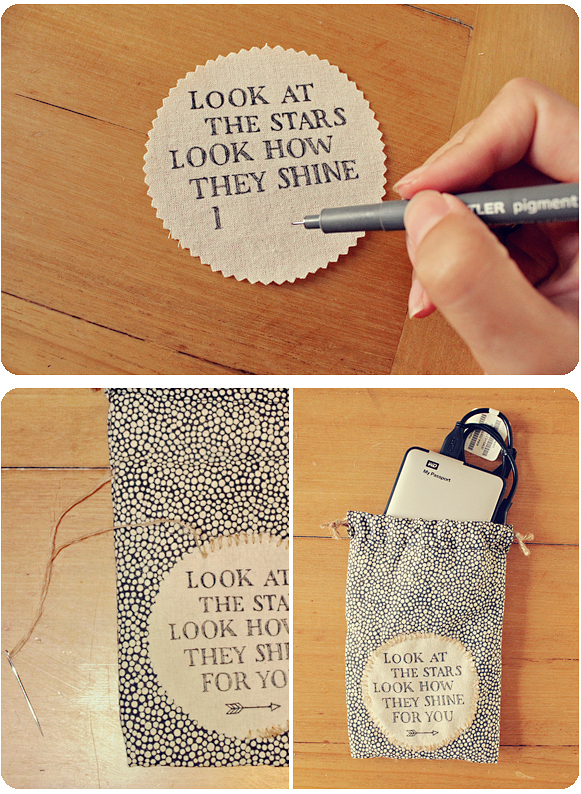 I wanted to make my bag a bit more exciting, so I cut out a circle from some calico and wrote on it. 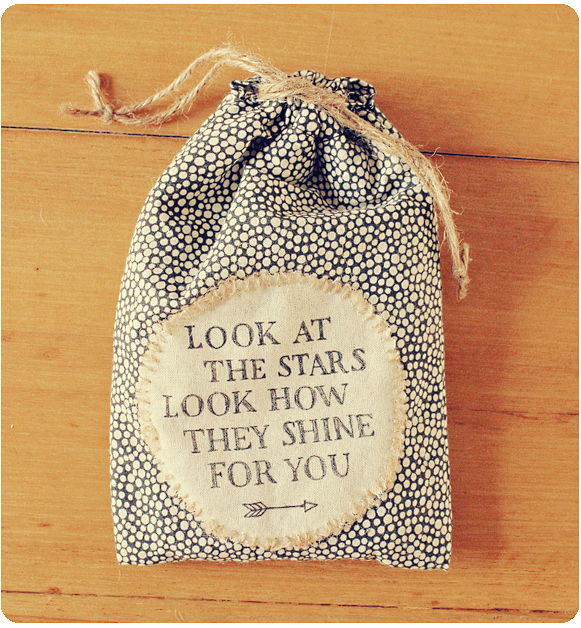 The spotty black and white fabric that I used reminded my of stars and I couldn't help but use the lyrics from Coldplay's Yellow. I stitched the medallion onto my bag with the same twine that I used for the draw string which, I must admit, was a bit of a challenge! But I was pretty happy with the final outcome.